Winter hiking can be a beautiful and fun experience. The contrast of land in different seasons can make the same destination seem like an entirely different planet, but equally, or even more beautiful. Whether you have hiked hundreds of times in the winter, or you are considering your first winter hike, this post is meant to help keep you safe, and have an unforgettable experience in the outdoors. This is one of the most important ways to stay warm during winter hikes. Hikers will inevitably be working harder at some points, and less hard at other points. Having the ability to take off layers, and put layers back on will keep your body from getting too warm or too cold. On your ascent up a mountain, you don’t want to be soaking through all of your layers, reach an exposed summit, and have all of that wet clothing start to freeze. It is dangerous, and not very comfortable. This is particularly important with your core area. Be sure to have a base layer that is capable of wicking (synthetics or wool are best). You’ll want at least a warm layer on top of that wicking layer, and another waterproof and windproof layer on top of that. Pro Tip: Bring extra socks and an extra hat just in case. Bonus Pro Tip: Winter hikes with exposed summits often means cold wind. You may want to bring a balaclava and ski goggles to prevent wind burn. Check out our Winter Hiking Clothing Guide to know exactly what type of clothing you need on your winter hikes. This means bringing the proper gear, knowing your location well, having a map, and checking the weather before you go. 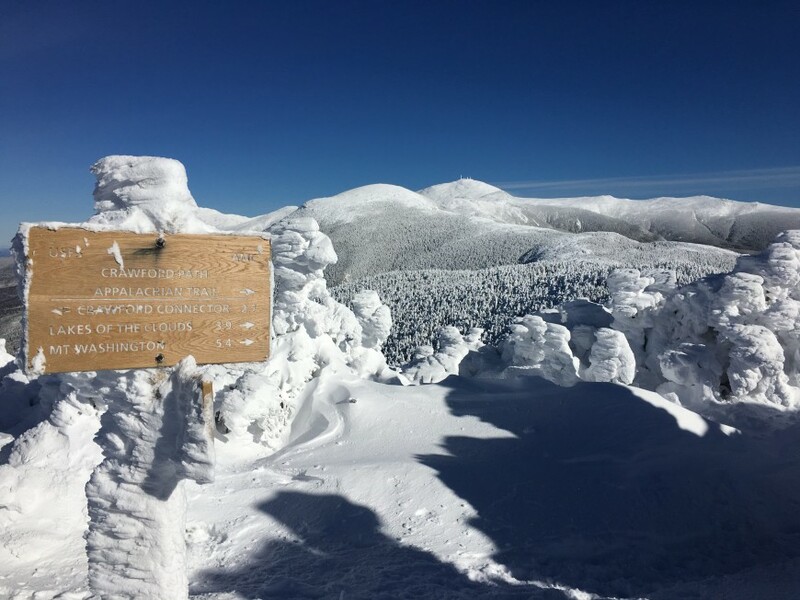 Winter hiking can be dangerous, it is important to eliminate the possibility of getting lost, getting stuck in weather, and having the proper equipment. In order to do all these things, you should research where you are going ahead of time. Just winging it in the winter can be dangerous. Check the weather right before you leave, make sure you have an accurate and quality map of the area you will be hiking in, bring first aid equipment, extra warm gear, and some emergency supplies (See gear below for more details). Pro Tip: Check the current trail conditions for the hike you will be attempting. Many locations have forums where hikers post the current trail conditions. This is great for understanding the need for microspikes, or snowshoes. It is important to stay hydrated while hiking. Your body will begin to shut down very quickly when dehydrated, and this isn’t only possible on hot summer days. Hikers tend to drink far less on winter hikes, but the body often needs just as much, if not more water on winter hikes. Make sure your water is insulated in a container that will prevent freezing, or your camelback has the proper insulation. A great way to stay hydrated while also keeping warm is to bring soup, hot water, or tea on your hike. Pro Tip: Don’t have an insulated bottle? Try wrapping in a sock or hat. The food you bring doesn’t have to differ from summer food, but it is usually quite helpful to bring food you can eat while still moving. Stopping on cold days will bring your body temperature down. Protein bars, gel packs, and other endurance snacks are great on the move that can provide the necessary calories, sugar, protein, and electrolyte intake to keep you moving. Pro Tip: If you are on a long hike and intend on stopping a while for views, soups are fantastic as you can keep them warm in a thermos, and they will keep you warm while you enjoy the views. The days can be pretty short in the winter. If you have a long hike ahead of you, it is important to start early to avoid getting stuck out after sunset. If you have a shorter hike, try being on the trail during the warmest time of the day. Attempting to summit at the warmest part of the day will make your summit experience a little more enjoyable, and your trip back a little nicer as well. There is nothing wrong with hiking alone, but it is far safer to hike with at least one other individual. Plus, you get to share an awesome experience with someone else. If you are hiking alone, be sure to provide someone with your exact day plans, and to follow all of the best practices to ensure your safety in case something does go wrong. Aside from clothing, people often refer to the 10 essentials for hikers to bring. Don’t go on a winter hike without microspikes. This list gets a little bit longer for some in the winter. See below for a more detailed list of items you’ll need. In summary, you absolutely need insulated boots to keep your feet warm and dry, layers to regulate your body heat, proper nutrition, hydration, and traction for icy conditions. Winter can be brutal, and the weather can turn quickly. When the weather does turn, your hike is taking longer than expected, or you aren’t fully prepared for the summit or rest of the hike, it may be time to turn around. It is essential to make it home, it isn’t essential to make it to the summit. The mountain will be there next week, next month, next year, or even next decade, make sure that you are too. Pro Tip: Know the dangerous points ahead of time. If there are very steep and icy sections, or sections of your hike above tree-line, these tend to be the most dangerous. Hypothermia occurs when your body’s temperature decreases to a temperature in which the body’s functions are impaired. Hypothermia can affect your ability to move in a necessary fashion, and to think clearly. Symptoms of hypothermia: shivering, memory loss, slurred speech, exhaustion, numb hands and feet, shallow breathing. Immediately try to bring up the body’s core temperature when experiencing any of these symptoms. On every hike, there is a list of items that you should always have in case anything goes awry. This list is often known as the 10 essentials list, but it doesn’t quite cut it for most winter hikes. When going on longer winter hikes, this list should be lengthened, and made more detailed to include more items to keep you safe and warm. This may seem like a significant amount of things. It is. If you truly want to make your hikes as safe as possible, you want to abide by all of these tips, and carry all of this equipment. With this being said, there is a balancing act of weighing risk vs reward, speed vs preparedness, and this can leave a lot of gray area when preparing for many of your hikes. The key to being safe and having fun is knowing how to balance all of these things with your skills, the current weather conditions, the number of others you expect to see on the trails, and the details of the hike you are attempting. If you are new to hiking, or simply new to winter hiking, it is important to start out your winter hiking cautiously. As you get more comfortable with going out in cold weather conditions, you will better be able to manage your equipment and trip plans. Just always remember that nothing is more important than returning home. When Do You Need Microspikes, Snowshoes & Crampons? If you are new to winter hiking, you might be wondering when it is necessary to have microspikes, or crampons, or snowshoes. This is a good question. On any winter hike, you should bring Microspikes. Many hikes will have sections that can be extremely icy and steep, where microspikes are essential for staying safe on the trail. Crampons are usually only necessary for more serious climbing and mountaineering. In the winter, you will see many hikers with snowshoes, when the snow is packed down, and there really isn’t a need for snowshoes. This often just makes the hike more difficult than it needs to be. Alternatively, you will see hikers sinking knee deep every step because they didn’t bring snowshoes. If there is a chance of snow beyond 5 inches deep, or a snowpack that is melting and easily giving away, snowshoes are great to have. Your best bet is to bring them if you have them, test the terrain, and determine if they are worth having on or not. It is common to take snowshoes on and off while hiking a trail. Keep in mind that in windy areas, snowdrifts can create extremely deep snow that you wouldn’t expect from other parts of a trail.